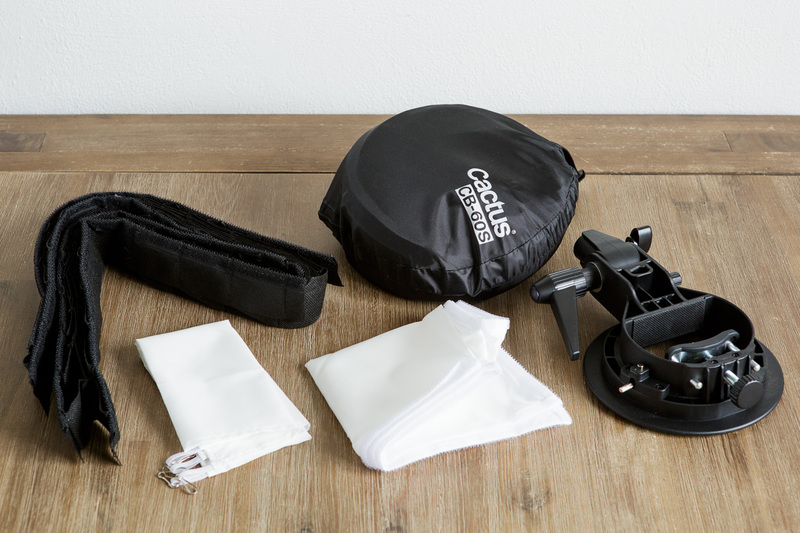 Cactus has kindly sent us one of their foldable softboxes for review. We’re testing the silver version of their 60x60cm softboxes, the CB-60S. 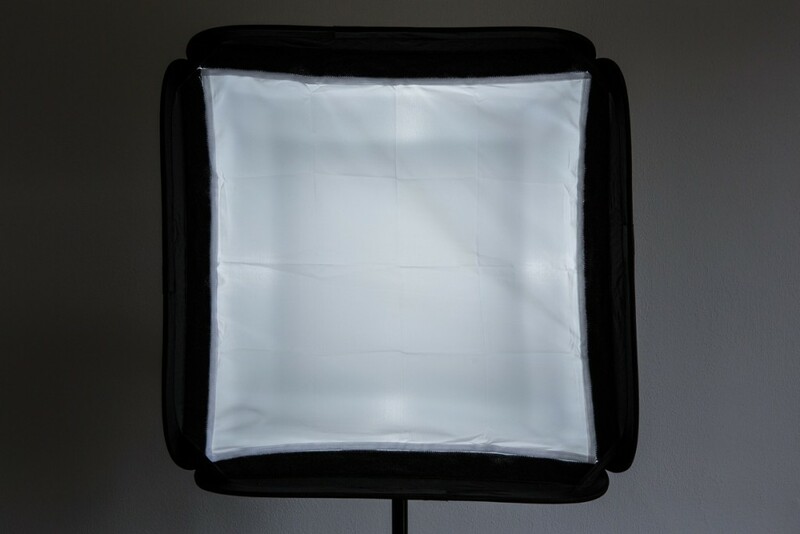 This softbox is designed for use on location, which means that it has to be portable, easy to set up and tear down, sturdy, all while providing soft yet contrasty light. 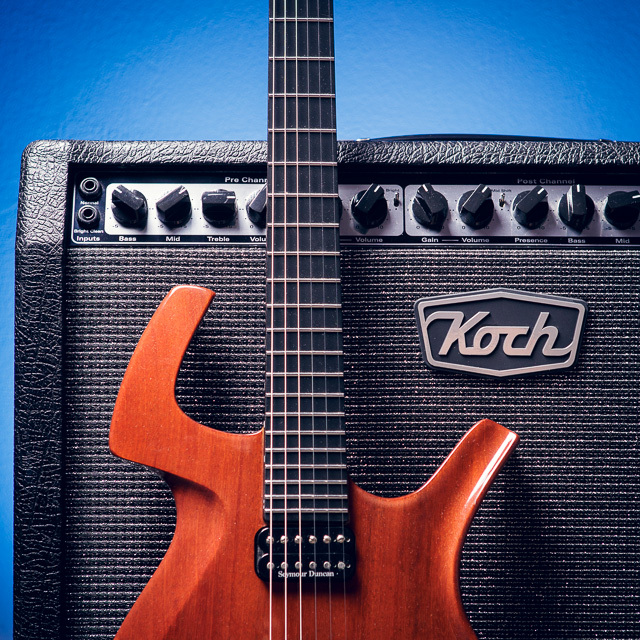 Read on to see how the CB-60S performs! 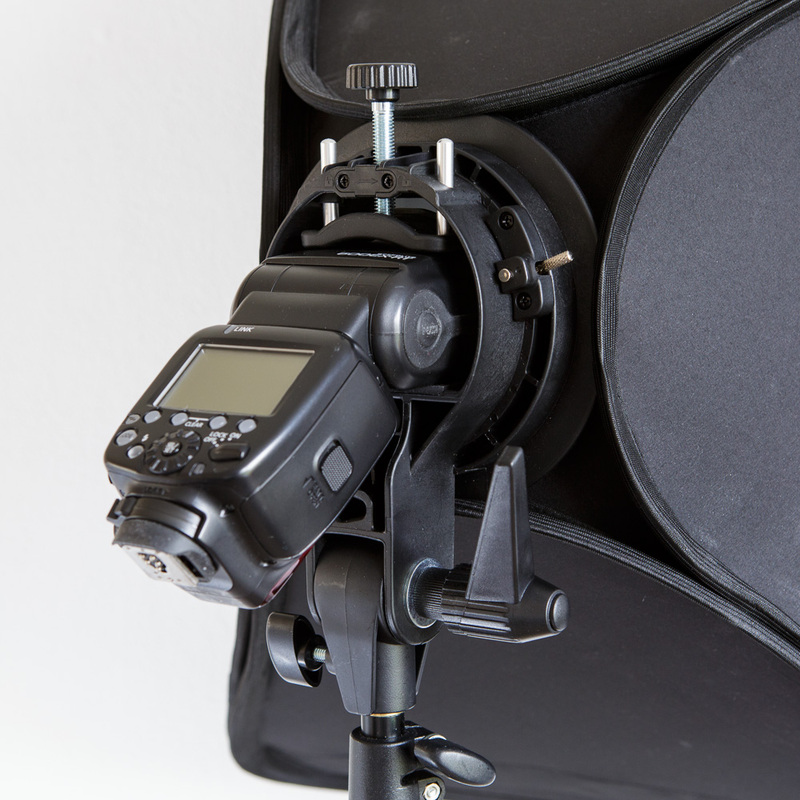 The Bowens S-Type mount facilitates a single speedlight — the softbox is mounted by simply clamping the mount between the ribs of the softbox. 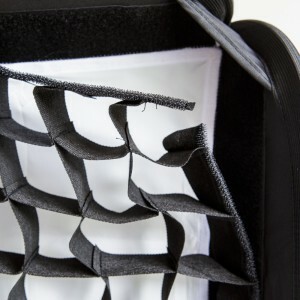 The sofbox folds the same way as a circular reflector, by twisting it and then pushing it flat. 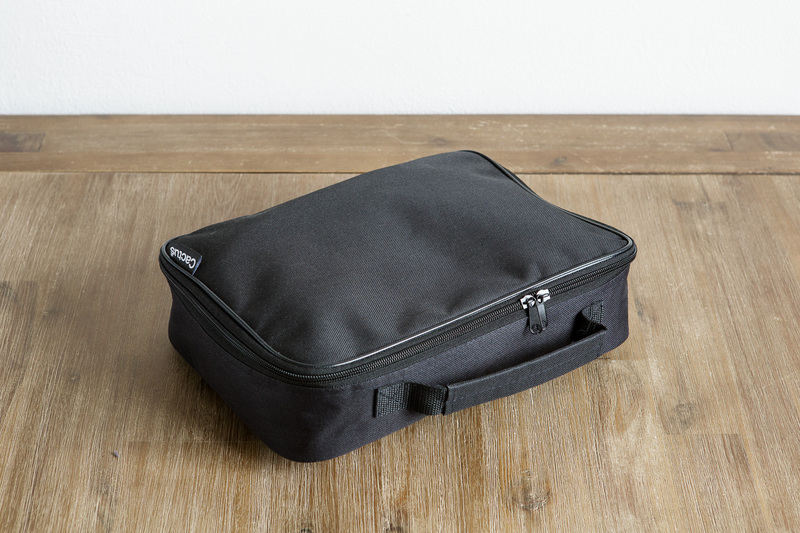 While the carrying case nicely accomodates everything inside, the pouch for the softbox is a bit of a tight fit. This means it takes some practice to put the softbox back in it once you’ve taken it out, and that there can be quite a bit of stress on the zipper if you don’t fold the softbox neatly. The stitching on the pouch looks well enough, however after intensive use it could possibly tear under the stress. That being said, all parts look and feel well made and solid, without any rough edges or loose threads. 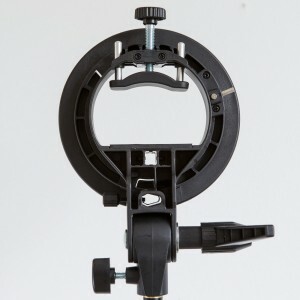 Especially the mounting bracket feels very solid, and as it’s a Bowens S-Type, it can be used for other modifiers with the same Bowens mount. Not everyone is a fan of the ‘clamp down’ way the bracket provides for mounting speedlights, but we never experienced any problems ‘crushing’ flash guns with this type of mount. Moreover, mounting a speedlight at the flash head provides more freedom in rotating the IR receiver in the flash towards the wireless master. And you don’t have to adjust anything if you decide to use a radio trigger (not all flash brackets accomodate more bulky triggers like Cactus’ own V6). 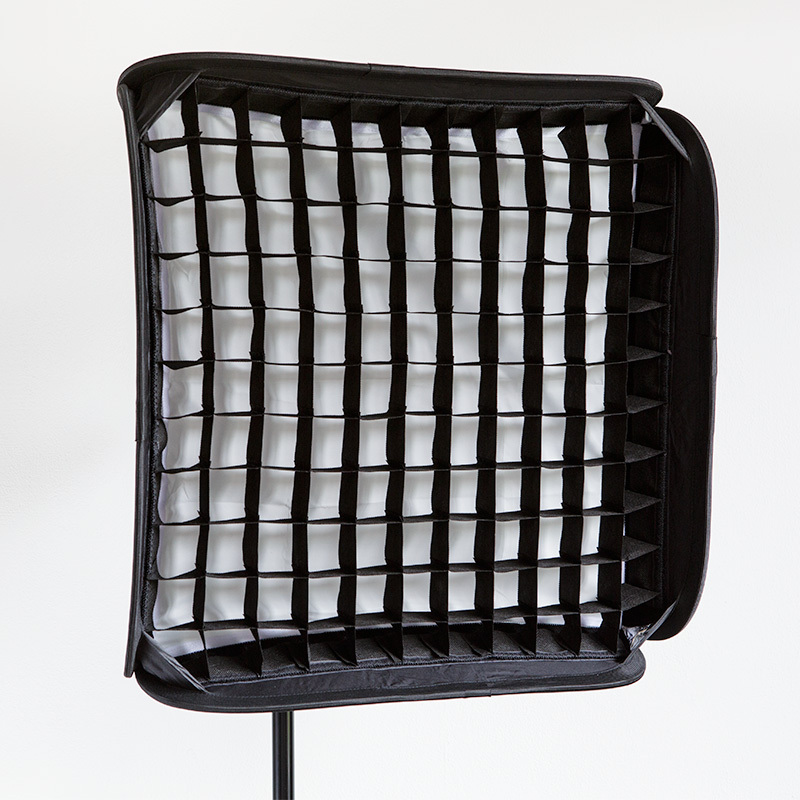 Having both a grid and an inner diffuser cloth is somewhat of a luxury in softboxes in this price range ($80-$100). The CB60-S is a breeze to set up. Put the bracket on a light stand, unfold the softbox and clamp it around the S-Type mount, put in a speedlight, hook in the inner diffuser, velcro in the outer diffuser, velcro on the grid , and you’re done. With a bit of practice, you’re done in under a minute. For a bit more ‘oomph’ (when strobing in bright sunlight, for instance), you leave out the inner and/or outer diffuser. And if you don’t need the more tightly controlled light the grid provides, leave it off. Let’s go over the external controls and features. Made out of very solid feeling plastic, this mounting bracket can accomodate any other compatible lighting modifiers you may have. The fact that it can also be used with umbrellas (note the hole with a locking screw) is a nice touch. 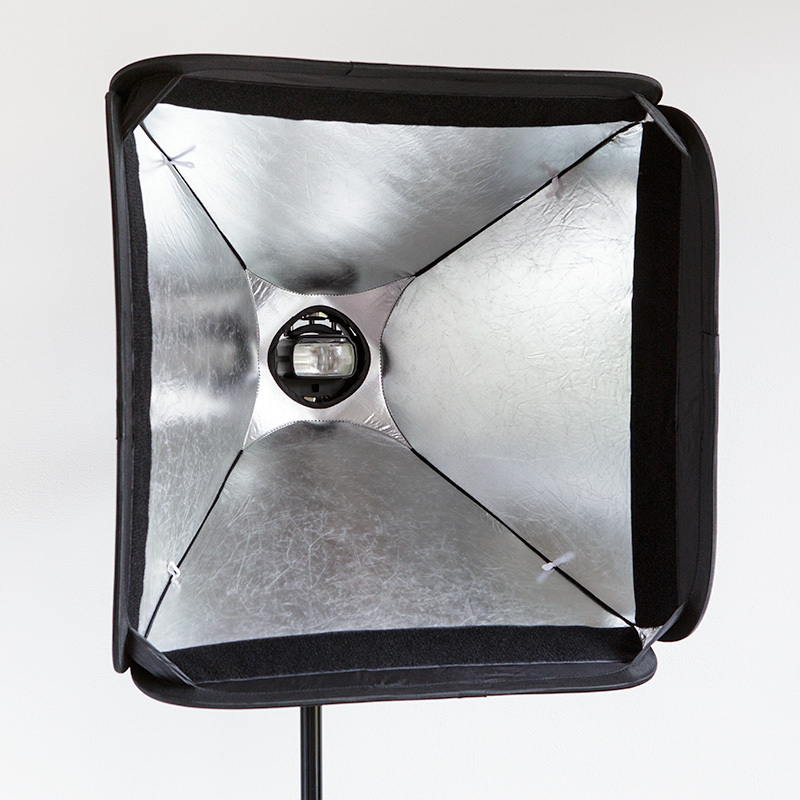 The mounting bracket allows the softbox to be tilted up and down on the stand. 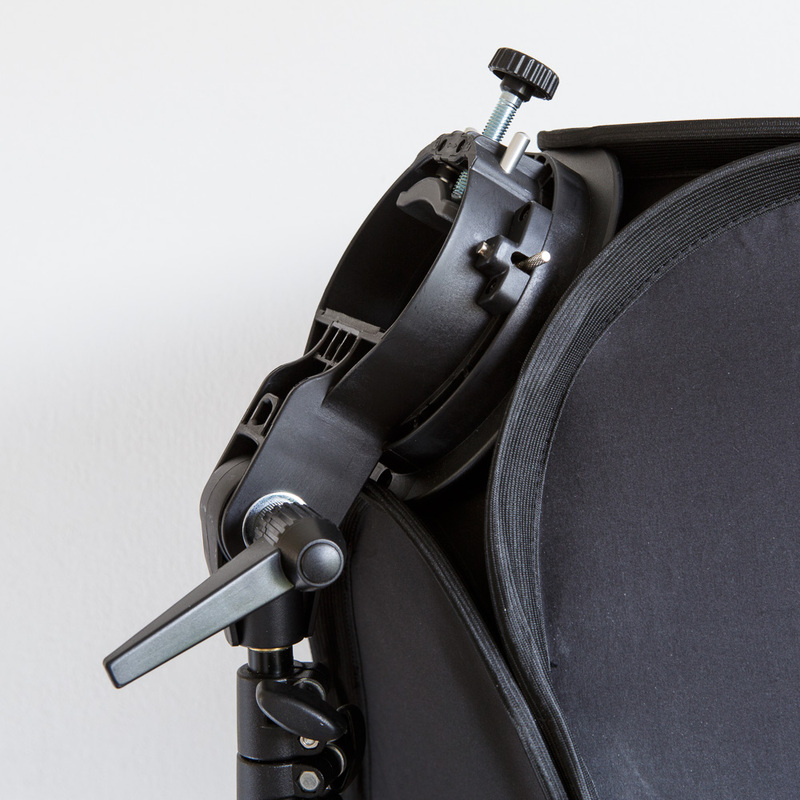 If you want to tilt it further down than in the image, you will need to use a boom or something similar. While this type of tilting bracket allows for less freedom of adjustment than a ball head, it does lock into place more securely, which is very useful in windy conditions. Initially tilting the bracket may require a bit of force, but less so after some use. The adjustment lever works very well. It can rotate freely when pulled out, so that you can use it like you would a speed ratchet (speed wrench) to loosen and tighten down the bracket. While not uncommon, this lever is again a nice touch and much easier to use than those butterfly nut kind of knobs. A speedlight is mounted by simply inserting it and tightening down the clamp with the knob at the top. While this is a secure and fast way of mounting speedlights, some care may need to be taken not to scratch the front of the speedlight on the bracket. With the Canon 580EXII mounted here, the tilting mechanism of the flash head is strong enough to keep the body of the flash clear of the bracket. The mount is big enough for even larger speedlights like Canon’s 600EX and Cactus’ RF60. The grid is nicely made and fits the softbox well — that is to say that you can be a bit sloppy when mounting it, while still being able to reach all four sides of the softbox. Very nice when you’re in a hurry. For usage indoors, the size of the CB-60S means that it can be used even in smaller rooms. 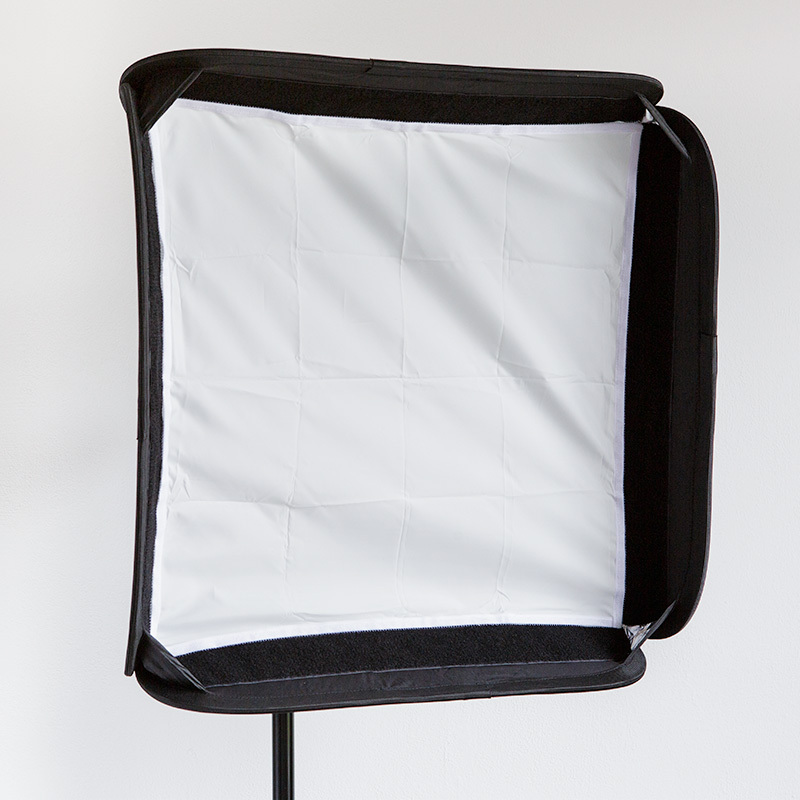 This is aided by the grid, which prevents light from spilling on your backdrop or randomly bouncing around the room. Its size and weight make the CB-60S very suitable for outdoor use. Preferably with an assistant holding it on a monopod, but using a light stand or boom with some sand bags is also a viable option if you can get it close enough to your subject. As setting up and tearing down the CB-60S takes some practice (especially folding up the softbox), make sure to practice this before doing a shoot on location with a model or client — you may look clumsy if you don’t and will needlessly keep them waiting. Once you get the hang of it though, the process is easy and fast, which means you only have a small package to take along with you and still be ready to shoot in under a minute. With zoom settings on the speedlight set to 24mm or wider, the CB-60S provides nice even lighting, without the hotspot that you often get with softboxes without an inner diffuser (or with an umbrella). The light is distributed evenly over the front diffuser. Please note that contrast and clarity have been increased in this image to more clearly show the pattern of light. With both diffusers on, the CB-60S gives nice even light, but does of course ‘eat up’ some of the flash output. In bright conditions, you have the option of leaving out one or both of the diffusers — this does mean that you get more of a hot spot, but it’s nice to have the flexibility. With its silver interior lining, the CB-60S gives somewhat punchy light, especially when placed close to the subject. If you prefer a less contrasty result, you can opt for the CB-60W (which has a white lining) instead. At 60x60cm, the CB-60S is large enough to provide soft shadows that are very clearly different from anything you’d get with a bare speedlight or a reflector. An example of the light provided by the CB-60S. Note the soft shadows, high contrast and gradual fall-off of light. The back wall (lit by a separate speedlight behind the amplifier) is only about 30cm behind the amplifier, yet no light from the main flash spills onto it. The CB-60S is an excellent piece of gear for $80-$100. It’s well made, with sturdy (and what look to be durable) materials and well thought-out features — although not everyone will like the clamp-down speedlight mount. 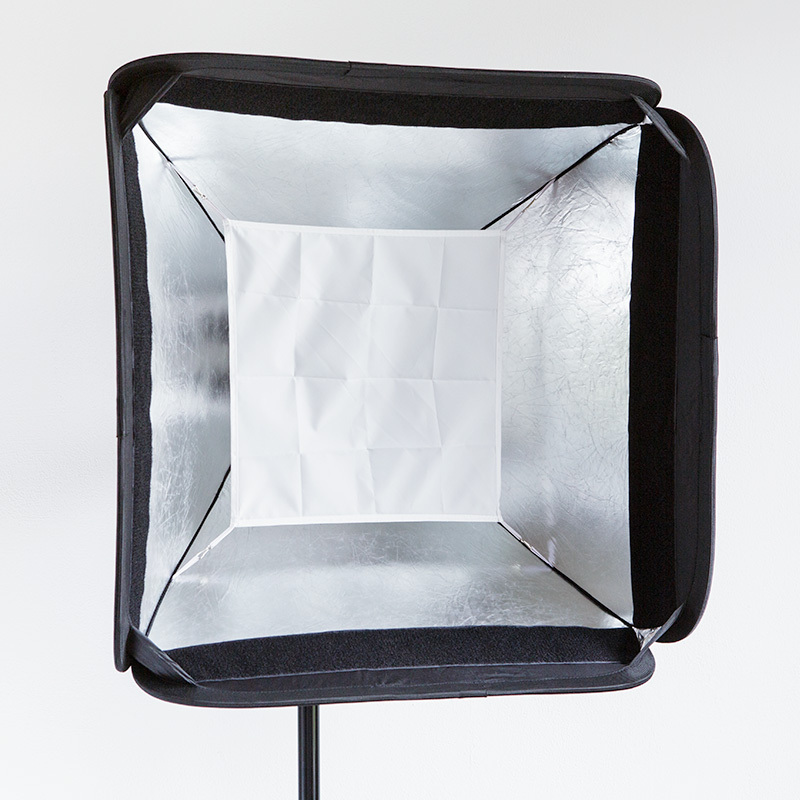 Especially folding up the softbox takes a bit of practice, however once you get the hang of that, setting it up and packing it back up is a quick process — which is essential when using it on an assignment. 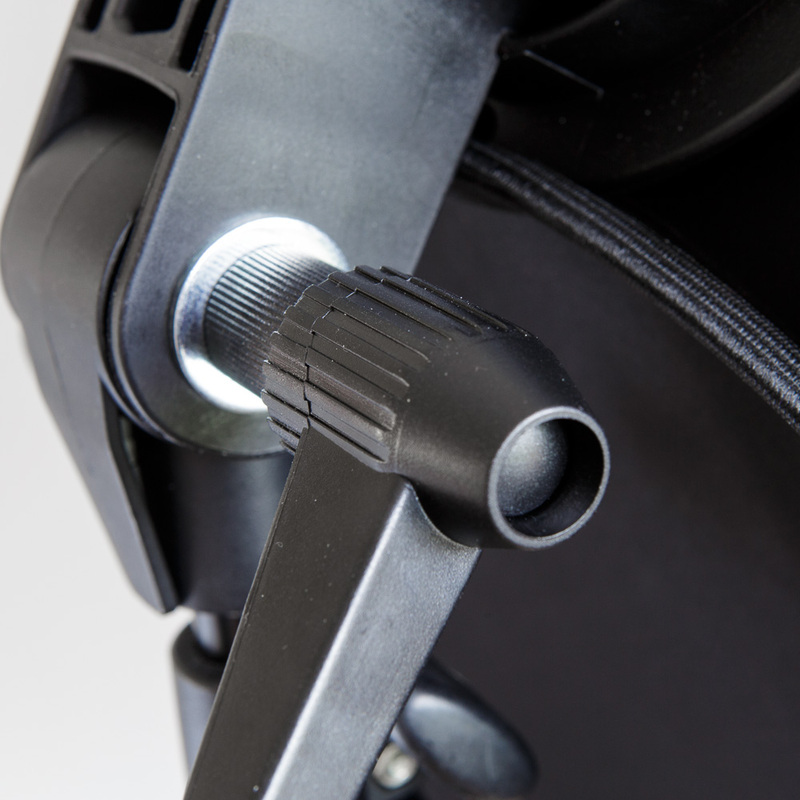 The grid, two diffusers and Bowens S-Type mount make it a versatile modifier, and the sturdy tilting bracket can withstand a knock or a gust of wind with ease. And the quality of light is even, soft and contrasty, as it should be. Its ease and speed of use, quality of light, and size and weight make the CB-60S well suited for use on location and in smaller studios. It’s a well-designed product, that will last you a while. Hi! Thank you for doing this review. I wonder if you could tell me where i can buy this CB-60S, since i haven’t been able to find it anywhere (i live in Europe, Spain). You could also look for the CB-60W, which is the same as the CB-60S, but has a white lining rather than silver. Un manuel ou une méthode pour replier la boite à lumière ? Ouiii ! Un grand merci pour ce coup de pouce.